The long arm of the law has finally caught up with a notorious gang, as the Lagos state police command confirmed that they have arrested a child buying and selling syndicate in the state. The woman who bought a baby from them is dead. A statement from the state police command spokesperson, CSP Chike Oti, said on the first day of May 2018, the Command received a complaint from one Nwoagbo Ekene of 27 Test Oluwale street, Olodi Apapa, that on same date, at about 1100hrs, his two-year-old daughter suddenly disappeared and all efforts made to trace her whereabout proved abortive. Based on his complaint, the Command Commissioner of Police, CP Edgal Imohimi, directed the officer in charge of the Anti-kidnapping Squad, SP Musa Bulus to use all the assets at his disposal to unravel the mystery behind the disappearance of the little girl. Consequently, investigation was instituted and in the course of it, one Ms. Joy Okoye, 28, of No.64 Kirikiri street, Olodi Apapa was arrested in connection with the case. 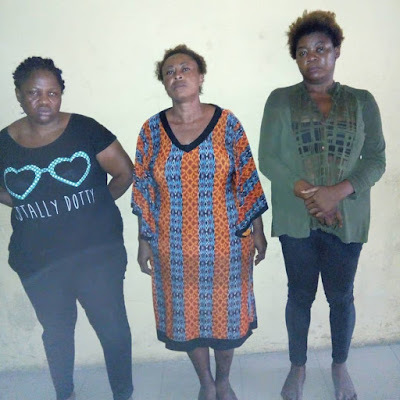 On interrogation, the suspect revealed that she and one Amarachi (surname unknown), a female, who is still at large, stole the child and sold her for three hundred thousand Naira (N300,000.00) to one Ms. Uju Obieze, female, 40, of No.8 Okwe road, Asaba, Delta state. Acting on this revelation, detectives proceeded to Asaba and apprehended the said Uju on September 13, 2018. The said Uju confessed to have bought the child from Joy Okoye but added that the deal was done jointly with one Ifeyinwa Ezene, female, 46, of No.2, Eze Bishop street, Onitsha, Anambra state, where Ifeyinwa Ezene was apprehended and she confessed to the crime by corroborating the statements of the other two suspects. She added that the child had been resold to one Ifeoma Okoye, female, who lives in Enugu. The trio led detectives to No.40, Amaechi street off Agbani road, Enugu, where, on September 14, 2018, the victim was rescued from the relatives of the said Ifeoma Okoye who were mourning her, having died a week earlier. The little girl has since been reunited with her parents. Meanwhile, the suspects will be charged court on Wednesday.